Uglyworld #539 - It's Super Duper Choco Chipo Cookie Time (140-365), originally uploaded by www.bazpics.com. Today Babo went out on a hunt for "super duper choco chipo cookies", and he said he wouldn't be coming home until he found some. 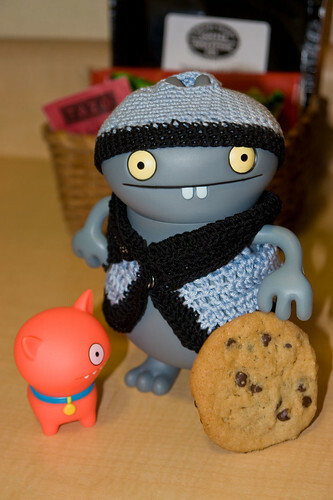 By the time he returned to the hotel this evening he was completely exhausted, but he did have a single cookie with him, unfortunately for Babo however Ralf also has his eye on the cookie.